Harry Jackson has become widely known as an accomplished sculptor and painter with a limitless range while residing in Cody, Meeteetse, and Lost Cabin, Wyoming, for seven decades. Harry Jackson (b. 1924). 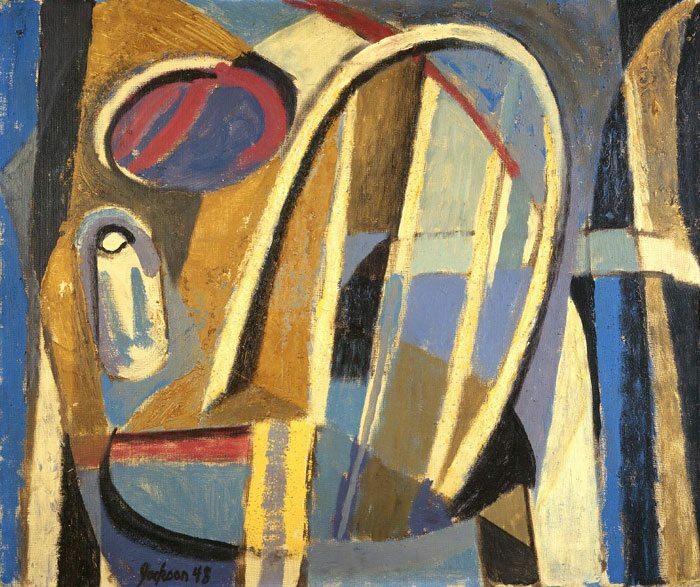 Untitled, 1948. Oil with sand on canvas; 21.06 x 25.9 inches. Gift of Jane Louise Shapiro. 5.99. Jackson was born in Chicago, Illinois, April 18, 1924. A difficult childhood resulted in his leaving in May 1938, at age 14, to cowboy with Cal Todd on the Pitchfork Ranch near Meeteetse, Wyoming. Each winter, from 1938 through 1942, Jackson returned to Chicago to study painting at the Academy of Fine Arts and the Art Institute. His Cody friends, Betty Phelps and Jesse Frost were fellow students. In 1942, at age 18, Private First Class Harry Jackson USMC joined the Fifth Marine Amphibious Corps as General Intelligence’s first combat-sketch artist. He fought in three amphibious assault victories across the Central Pacific; wounded twice, he suffered from the effects of his injuries for the rest of his life. Harry Jackson (b. 1924). “The Stampede,” 1965. Oil on canvas; 111.25 x 245.75 inches. Gift of The Coe Foundation. 29.65. Harry Jackson (b. 1924). “Cosmos,” 1996 – 1997. Bronze, egg tempera; 16.3 x 13.5 x 43 inches. Gift of Gordon Barrows, David Leuschen, Robert Model and James Nielson. 25.97. In March 1945, Jackson began a private journal which grew to 131 volumes. Receiving an honorable discharge in October 1945, he wintered on Wyoming’s Pitchfork Ranch, and then went to New York in May 1946. While Jackson’s cowboy art is collected world-wide, he confounded the art world by creating abstract and non-objective art influenced by Pollock and Kandinsky. Jackson’s work is housed in a number of museum and private collections including the Metropolitan Museum of Art, New York; Smithsonian American Art Museum, Washington, D.C.; Denver Art Museum, Denver, Colorado; Amon Carter Museum, Fort Worth, Texas; Gilcrease Museum, Tulsa, Oklahoma; American Museum In Britain, Bath, England; Ronald Reagan Presidential Library, Simi Valley, California; and the Lyndon B. Johnson Presidential Library, Austin, Texas. His work is also in the personal collections of Queen Elizabeth II, the Saudi Arabian royal family, the Italian Federal Government, and the Vatican. The first four Quartet paintings, created in April 2005, are featured in the film Harry Jackson Talks About Art, which shows how his non-objective artwork unites with his realistic Stampede and Range Burial canvases and bronzes. These former pieces were commissioned by Ambassador Robert Coe in 1958, and installed in the Whitney Gallery of Western Art (now the Whitney Western Art Museum) in 1965. The Honored Artist for the 2006 Buffalo Bill Art Show and Sale, Jackson’s newest multi-colored bronze sculpture Sacajawea Modified II (2005) was the featured work for the Show and Sale that year. Harry Jackson passed away on April 25, 2011. Broder, Patricia Janis. Bronzes of the American West. New York, New York: Harry N. Abrams, Inc., 1973. Burk, Dale A. A Brush with the West. Missoula, Montana: Mountain Press Publishing Co., 1980. Duty, Michael. Western Traditions: Contemporary Artists of the American West. Albuquerque, New Mexico: Fresco Fine Art Publications, 2005. Getlein, Frank. Harry Jackson: monograph – catalogue. New York, New York: Kennedy Galleries, 1969. Goddard, Donald, Larry Pointer and Marjorie Spitz. Sacagawea, a monument in bronze. Cody, Wyoming: Buffalo Bill Historical Center, 1980. Goddard, Donald and Robert Rosenblum. American Painting. New York, New York: Hugh Lauter Levin Associates, Inc., 1990. Hassrick, Royal. Western Painting Today. New York, New York: Watson-Guptill, 1975. Howard, J. Keir. Ten Years with the Cowboy Artists of America: a complete history and exhibition record. Flagstaff, Arizona: Northland Press, 1976. Jackson, Harry. Lost Wax Bronze Casting: a photographic essay on this antique and venerable art. New York, New York: Van Nostrand Reinhold, 1979. Jackson, Harry. Western Bronzes by Harry Jackson. Cody, Wyoming: Harry Jackson, 1960. New York School of Abstract Expressionists. Franklin Lakes, New Jersey: New York School Press, 2000. Myers, Fred A. Harry Jackson at Gilcrease. Tulsa, Oklahoma: Thomas Gilcrease Museum Association, 1980. Pezzini, Fabio, Franco Bolelli and Patricia Smith. Harry Jackson, 30 years of working in Versila. 30 anni di attività in Versilia. Camaiore, Italia: Comune di Camaiore, 1986. Pointer, Larry and Donald Goddard. Harry Jackson. New York, New York: Harry N. Abrams, Inc., 1981. Reed, Walt. North Light Collection 2: the works, viewpoints, and techniques of the contemporary artists as featured in the pages of North Light magazine. Westport, Connecticut: North Light Publishers, 1979. Walker, John, et al. Harry Jackson: Forty Years of His Work, 1941 – 81. Cody, Wyoming: WFS, 1981. Thornton, Gene. Harry Jackson: a retrospective exhibition. Cody, Wyoming: Buffalo Bill Historical Center, 1981. The Vantage Collection of American Western Art. Dallas, Texas: Vantage Companies, n.d.
Walker, John. Portraits – 5,000 Years. New York, New York: Harry N. Abrams, Inc., 1973.